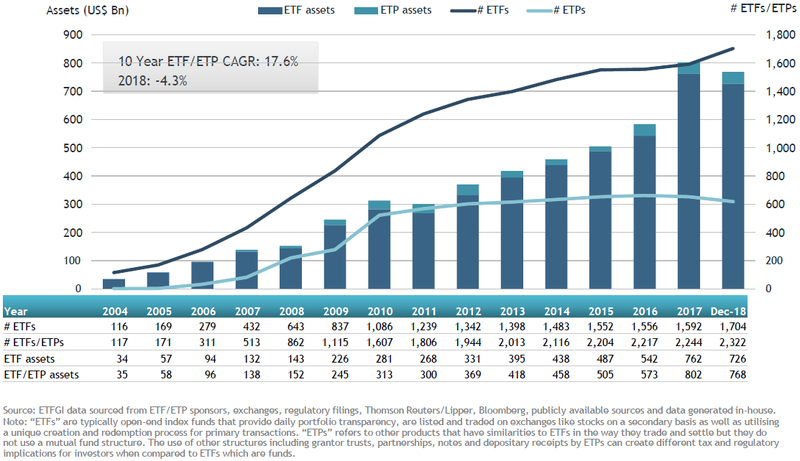 At the end of December 2018, the European ETF/ETP industry had 2,322 ETFs/ETPs, an 11.90% increase over 2017, from 70 providers listed on 28 exchanges. European Emerging and Frontier markets saw strong product growth throughout 2018, with 58 new ETFs/ETPs. Assets invested in ETFs/ETPs listed in Europe decreased by 3.22%, from $794 Bn at the end of November 2018, to $768 Bn at the end of December due to the market moves being greater than the $3.93 Bn in net inflows. By the end of the year, assets invested in the European ETF/ETP industry were down 4.25% compared to that of 2017, falling from $802 Bn to $768 Bn.